October 24, 2016 at 12:02 pm. Plenty of expected College Football Playoff contenders have run off the road this season, but it felt as if the first seismic shift came Saturday night in State College, Pa.
Penn State, in its signature victory of the post-Joe Paterno era, used a 17-0 fourth-quarter blitz to stun No. 2 Ohio State 24-21, the winning points coming on a blocked field goal return for a touchdown. The Nittany Lions completed eight passes all game and still beat the second-ranked team in the nation. Meanwhile, Texas Tech quarterback Patrick Mahomes II had an FBS record 819 total yards … and his team lost 66-59 to Oklahoma. The number of unbeaten teams from Power Five Conference schools dropped from nine to seven on Saturday, as the Buckeyes and Texas A&M fell. But while the Aggies are essentially boxed out in the SEC West by their loss to No. 1 Alabama, the needle didn’t actually move much on Ohio State’s playoff probabilities. 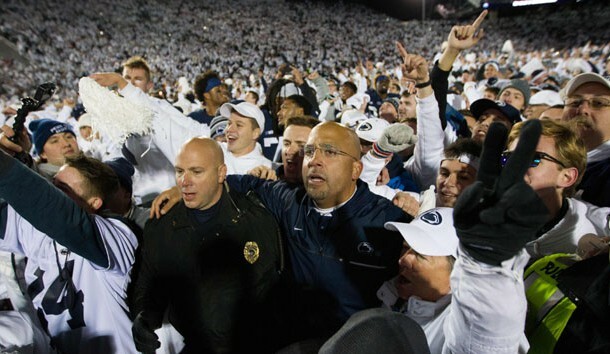 All that jumping around from the white-clad crowd in Happy Valley only seemed like an earthquake-like event. It’s too strong to say Ohio State still controls its own playoff destiny, but a playoff projection remains a smart pick. The Buckeyes’ two toughest remaining games — Nebraska and Michigan — are in Columbus. A road game at Michigan State no longer looks troublesome, as the Spartans are one of those teams that veered into a ditch, losing five consecutive games. If Ohio State wins out, it would win a potential three-way tiebreaker with Michigan and Penn State in the Big Ten East. The Buckeyes lose the head-to-head tiebreaker with the Nittany Lions. Penn State’s closing schedule is actually manageable — at Purdue, vs. Iowa, at Indiana, at Rutgers, vs. Michigan State — but do you really think the Lions can end the season on what would be an eight-game winning streak? Probably not, so the Big Ten East likely still comes down to Ohio State-Michigan. If the young Buckeyes can bounce back — and if they can successfully block a defensive front like Michigan’s, when they couldn’t against Penn State — Urban Meyer’s team will be in fine playoff shape. 1. Bad things can happen to Alabama. The Crimson Tide didn’t even play all that great, but it still dispatched previously undefeated Texas A&M 33-14. The bad news: safety/punt returner Eddie Jackson is out for the season with a fractured leg. “I think he was an All-American player as a safety, at least in my book,” said coach Nick Saban. 2. Tony Gibson’s stock is way up. Pay attention. The West Virginia defense, coordinated by the suddenly red-hot Gibson, has held Texas Tech and TCU to a combined 27 points and 679 yards in the past two weeks. How impressive is that? Consider: For the season, those teams combine to average about 86 points and 1,140 yards per game. 3. Mike Leach should be smarter than this. Leach was fined and publicly reprimanded by the Pac-12 last week for comments about Arizona State allegedly stealing signals. Sun Devils coach Todd Graham in Saturday night’s postgame handshake, was caught telling Leach something about “chicken” and “bull” stuff. Leach then said he “respectfully declined to answer” press conference questions about ASU on the grounds it might get him fined. It kind of overshadowed Washington State’s first 4-0 conference start since 2003. 4. Well, sometimes coaches are dumb. BYU’s Kalani Sitake called for a fake punt on fourth-and-19 from his own 5 yard-line. OK, that’s just the half of it. The play he imagined would work was the punter running from about 8 yards deep in his end zone, which meant the punter — the punter! — had to traverse about 32 yards in order to get the first down. Yeah, didn’t work. Honorable mention: Iowa trailed Wisconsin 14-6 with 5:25 left when it faced fourth-and-5 from the 20. A touchdown and two-point conversion could tie, but coach Kirk Ferentz opted for a field goal. It missed. Even if it was good, Iowa still needed a touchdown. The Badgers thanked Ferentz and ended up winning 17-9. 5. Houston had a very bad week. Poised on its tip-toes for a big kiss from the Big 12, the Cougars were jilted when the league announced it would not expand. And then Houston’s big-bowl hopes were dashed in a 38-16 loss to SMU, a school that Houston coach Tom Herman mocked this spring in a speaking engagement, as reported by the Houston Chronicle, for having too-modest expectations. “I hear there’s a private school up in Dallas that’s really looking to try to get to seven wins,” he said at the time. 1. Leonard Fournette, LSU. Out for nearly a month, he ran for touchdowns of 59, 76, 78 yards, needing only eight carries to set the school single-game rushing record. He finished with 284 yards on 16 carries — and a showdown versus Alabama is only two weeks away. 3. Joe Mixon, Oklahoma. With RB Samaje Perine out with a leg injury, it was all Mixon — 263 rushing yards, 114 receiving yards and five touchdowns in a wild 66-59 shootout over Texas Tech. “I thought Joe Mixon had a game for the ages,” said Sooners coach Bob Stoops. 4. Brian Hill, Wyoming. We dislike versions of “He’s the best guy you’ve never heard of,” but it might truly apply here, so let’s do it. Brian Hill is the best running back you’ve heard of — unless you happened to catch the nation’s latest kickoff Saturday night and watched him run for 289 yards, despite battling stomach flu that caused him to throw up before and during a 42-34 win over Nevada. 5. Auburn’s entire backfield. Eli Stove broke out for a 78-yard on Auburn’s first snap, Kamryn Pettway rushed 27 times for 192 yards and Auburn — without starter Kerryon Johnson due to an ankle injury — steamrolled Arkansas with 543 rushing yards in a 56-3 victory. 1. QB Lamar Jackson, Louisville. He has 18 passing and 16 rushing touchdowns, outstripping the scoring pace of every other quarterback to win the Heisman this decade. The gap between Jackson and everyone else this season is huge. 2. QB Jake Browning, Washington. He is the nation’s leader in passing efficiency (204.9 rating), and that touchdown-to-interception ratio of 23-2 is pretty nifty. 3. DE Jonathan Allen, Alabama. His flying Superman sack of Texas A&M’s Trevor Knight is one for the postseason highlight shows, and then he added a scoop-and-score for his second TD of the season. 4. QB Deshaun Watson, Clemson. He has lagged behind Lamar Jackson all season, but a big performance in a showcase game against Florida State on Saturday could elevate him up the list. 5. LB/RET Jabrill Peppers, Michigan. He didn’t pad the box score — didn’t have to — in a 41-8 pillow-fight against Illinois. The make-or-break games for his potential invite to New York City are still to come. 1. Clemson at Florida State (Saturday, 8 p.m. ET) — Clemson controls the ACC Atlantic and stays on a playoff path even with a loss, so the stakes aren’t what they could be, but this is still a big-boy battle that promises fireworks galore. 2. Washington at Utah (Saturday, 3:30 p.m. ET) — Utah’s middlin’ offense has been revitalized by the return of running back Joe Williams, but the unbeaten Huskies have the best defense west of Tuscaloosa, Ala. A huge Pac-12 spotlight game. 3. Nebraska at Wisconsin (Saturday, 7 p.m. ET) — This won’t be Oklahoma-Texas Tech. This is Big Ten West football, and if the Badgers take down 7-0 Nebraska, it will be because of a shut-down defense that has allowed only Ohio State to score more than 17 points this season. 4. Auburn at Ole Miss (Saturday, 7:15 p.m. ET) — Auburn’s momentum will be tested by a fading Rebels team, and by fading we mean desperate, and by desperate we mean dangerous. 5. West Virginia at Oklahoma State (noon ET) — The 6-0 Mountaineers have their “they haven’t played anybody” doubters. This is somebody. Oklahoma State represents West Virginia’s toughest remaining road trip (Oklahoma and Baylor still have to go to Morgantown). Bonus game: There is no World Series game on Thursday night, so park yourself in front of Virginia Tech at Pitt at 7 p.m. ET for a key ACC Coastal game.